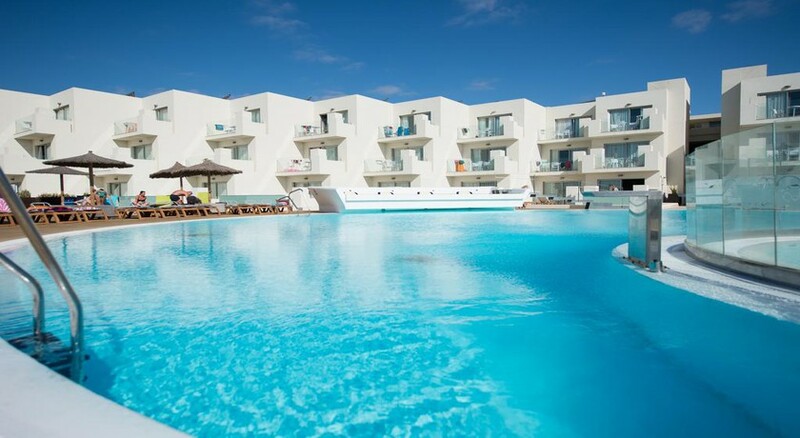 Ideally situated in the tourist area of Costa Teguise, Lanzarote, HD Beach Resort is a 4-star sea-facing venue oozing rest and relaxation. With spectacular sea and mountain views, HD Beach Resort won't disappoint in the scenery department. The hotel is positioned in front of a small beach and is just 250m from the Playa de las Cucharas beach which is fringed by shops, restaurants and bars – ideal if you’re seeking sun, sand and sea. 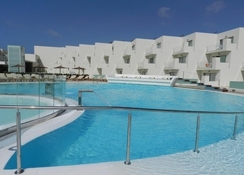 In-resort, facilities include two swimming pools, a sun terrace, a whirlpool, sauna, spa and jacuzzi. Sports and leisure activities are also available to keep fun-loving guests entertained. Dining options at HD Beach Resort consist of a main buffet restaurant and an a la carte restaurant, not to mention many restaurants available in the surrounding resort, too. Providing modern amenities and guest rooms of a comfortable size, the HD Beach resort caters to families and those looking to get away for a superb sunshine holiday. 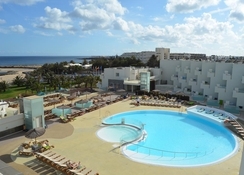 The HD Beach Resort is situated in the popular region of Costa Teguise. This region provides holiday makers with an abundance of things to see and do both in and outside of the hotel, from lounging on the beach of Las Cucharas to visiting the exciting Aquapark, 4km away from the resort. If you want to explore more of Lanzarote, the hotel is 250m from local bars, restaurants and shops and 5km from the lush Costa Teguise Golf Course. The Lanzarote Airport is only 15km from the hotel. This well-presented resort offers rooms in six categories. With sea and mountain views, the HD Beach Resort is sure to impress those who like to unwind on their suite balcony as the sun sets. The room types include Duplex, Junior Suite, Junior Suite Vista Mar, Kid Suite, Suite and Suite Vista Mar. The rooms include twin beds and an extra bed in the lounge area, alongside a full bathroom, cot space, wired internet access, air-conditioning, fridge, coffee maker, toaster, free WiFi, a safety deposit box, satellite TV and a balcony to enjoy either the sea or mountain view. The hotel houses three eateries to satisfy breakfast, lunch and dinner. The main buffet restaurant is called La Geria, experience a little more luxury at Gourmet Restaurant for a la carte, or relax at the Pool Bar & Chill Our La Graciosa with refreshments available. There are many restaurants in the surrounding resort if guests wish to discover the local cuisine. This air-conditioned family hotel was renovated to a high standard. It features an outdoor swimming pool, including a children's swimming area and a splash park for the family to enjoy together. For those looking to relax and pamper themselves while away, there are various choices from the spa which features a hot tub, sauna, steam room and massage treatments. Guests can also take advantage of multiple sports facilities that include volley ball tennis, crazy golf, water polo, basketball and more. Fab hotel lovely location and gorgeous weather if not a little windy..
Beautiful hotel , fantastic overall experience. Food and drinks were included and couldn't fault the both restaurants. Staff were very helpful and couldn't do enough for you .customer service was fabulous . Berta on reception was a lovely lady and hope to see her again soon . Great hotel and location was beautiful. Great value for money . Excellent! One of the best hotels I’ve stayed at! Stayed in a junior suite in September fabulous spacious room overlooking the sea. Room was cleaned everyday to a high standard. Dining room never too busy always enough tables free. Food was good, better than the usual all inclusive. Staff were amazing nothing too much trouble. Entertainment was good and general areas in the hotel were immaculate. Looking forward to our return trip! The hotel was lovely wth amazing views and the staff was so good and friendly. Entertainment for kids and adults was great every night was different. Overall a good hotel. Quality of the food was good. Good location with a short walk to the shops and a lovely walk around the coastline. Could do with more bar staff and a greater range of drinks by the pool. Staff were eager to please and overall had a good holiday. Our visit was in july and it was fine. Rooms were spacious with a lovely bathroom. 3 pools.. one for very young children which is enclosed and two other nice pools. One slightly annoying thing was the plastic cups which were left on the floor by guests blowing around. (Not the hotels fault). Beach in front of hotel isnt very nice but hotel has it all. Snacks served during the day at pool bar are a bit lame.